Online paper Haretz claims that Arif Jaradat, 23, a man with down’s syndrome was recently shot by Israeli troops. Jaradat, a man described as one ‘loved by all the children in his village’ died of his injuries last week. GDW has no means of confirming the story. Below is the original story. Mohammed has in fact been arrested five times, serving a total of 52 months in prison, some of them in administrative detention – he was arrested without charges or trial – and Arif lived in constant fear that the Israel Defense Forces would come to arrest him again. Mohammed’s detention in 2006 was especially burnt into Arif’s consciousness: Soldiers swooped down on the house in the middle of a freezing cold night and forced the family – including Mohammed’s infant son of 18 months – into the street of the town of Sa’ir, near Hebron. Snow covered the ground that night. Mohammed was most recently arrested in 2013. It happened on the street, and Arif saw it from the balcony of his house. Horrified, he started to cry out again, “No, my brother Mohammed!” He shouted the same thing in the late afternoon of May 4, two months ago, when he saw a force of six or seven soldiers moving on foot near his house. Hearing the shout, his siblings were filled with apprehension. Then they heard a single shot. They rushed to the scene and saw their brother sitting on the ground, bleeding. The soldiers ran off, not bothering to check his condition or summon medical aid. Arif died a month later, from complications of his stomach wound. Arif was a young man of 23 with Down syndrome. We can assume that the soldier who shot him noticed this; it should have been obvious from looking at him. His brothers shouted to the soldier in Hebrew: “He’s disabled, don’t shoot.” But the soldier fired at Arif from a range of about 10 meters. His brothers found Arif sitting on the ground, on the rocky slope that descends to the road from which the shot was fired, blood streaming from his stomach, screaming in agony. His six brothers and one sister loved Arif very much, and he was very close to them. His family nickname was “Hubb,” meaning love. They took Hubb almost everywhere. He especially liked to accompany his brothers to weddings, where they provide video-photography and deejay services, among their other occupations. In a clip filmed two days before Arif was shot, he’s seen holding the microphone and singing to the neighborhood children, who have gathered around him on the street and are applauding him and showering him with affection. Arif looks happy. He liked to perform for children at parties. It’s impossible to remain indifferent at the sight of these touching images. The thought that soldiers shot and killed him stirs profound anger and equally profound shame. Two weeks ago, I wrote in this space about a young man from the village of Awarta, H. who suffers from schizophrenia and was shot and wounded by soldiers and then was shackled to his hospital bed, without his parents being allowed to see him. Now comes the killing of Arif, the boy with Down syndrome from Sa’ir. There are seven siblings in the family. Their father, Sharif, felt ill this week and was rushed to the hospital. He hasn’t recovered from the death of his son. Three of Arif’s brothers – Mohammed, Hasan and Saari – are sitting with us in the family’s living room, talking sadly about their dead brother. They show us photographs of him before he was shot, and also in the hospital. They photographed him nonstop. Here he is in a T-shirt emblazoned with a portrait of Che Guevara. “Arif the communist,” they chuckle. Their love for him shines through every word they speak. Arif himself was involved in a different love story. He was in love with Jinan, a woman he created in his imagination, someone who never existed, to whom he sang love songs and to whom he pretended to be engaged. Occasionally he spoke to her on the phone – “Hello, Jinan” – as though she were really on the other end. Until the age of 7 he attended a special-education school in the neighboring village of Bani Na’im, but stopped after the driver of the school bus struck him. He refused to go back after that incident, even when his brothers said they would take him. Instead, he stayed home or wandered around the village. He liked to watch television, listen to music and play on the computer. Lately he also had a tablet – his brothers show it to us. Arif also liked doing debka dances. And he loved cola, downing whole 1.5-liter bottles. “A friend to everyone,” his brother Sa’ari says in his Hebrew. Several of Arif’s brothers were arrested on security charges over the years, and he visited them in prison. Occasionally he would reprise for his siblings the security checks he himself underwent at the entrance to the jails. He was very frightened of soldiers and others in uniform. Wednesday, May 4, was like any other day for Arif. His father sent him out to buy cigarettes, he watched television and played on the computer, and after lunch went outside. At about 5:30 P.M., the four siblings who were home smelled tear gas coming from the street. They hurried out to find Arif. They heard children whistling outside, as they always do here when soldiers invade the village. No one was throwing stones, Arif’s brothers say. Then they heard the familiar shout, “No, my brother Mohammed!” They saw Arif waving to the soldiers as though telling them to leave. Suddenly, they relate, Arif stopped walking and stood dead still, as though paralyzed. They are certain that he was gripped by fear. Arif stood on the rocky slope, at the western edge of Sa’ir. The soldiers were making their way on the village road below, some 10 meters away from him. The brothers took cover behind the rocks, to escape the tear gas. At a certain stage they lost sight of Arif, who was hidden from them by the rocks. They only saw the soldiers leaving – apart from one who stayed where he was, perhaps to provide cover for the others. He’s the one who shot Arif. Then they heard the shot and their brother’s screaming. They rushed to him, the soldiers ran off, and one of the brothers, Hassan, picked Arif up, carried him to the road and bundled him into a car. There was an entry wound in his stomach and a large exit wound in his hip. Arif was bleeding but fully conscious. “My brother, blood,” he mumbled. Hassan tried to calm him, telling him that they would get him to a doctor and everything would be fine. They took him to the village clinic, from where he was rushed by ambulance to Al-Ahli Hospital in Hebron, where he underwent a seven-hour operation. Some of his internal organs, including his intestines and his liver, had been ripped open by the bullet. He spent 22 days in the hospital, 15 of them in intensive care. On the 18th day he was given a cola, as he liked. Finally, he was discharged. At home he felt well and was able to walk around. Before his discharge Arif presented the physicians with a plaque of appreciation for their efforts. There’s another plaque – in the house, presented to Arif by his friends, with love – marking his release. And here’s a picture of him with his doctor in the hospital, Dr. Mohammad Hashlamoun. And the village physician, Dr. Zuheir Jaradat. And this is a photo of Muntasar, Arif’s good friend, crying next to his bed in the hospital. Arif went to the hospital once a week for checkups after he came home, and to the local clinic for daily monitoring. Life was back to normal. But before dawn on Friday, June 17, more than a month after he was shot, Arif felt excruciating pains in his stomach. The family rushed him to the hospital, where he was given an injection and sent home. An hour later the pains returned in full force. 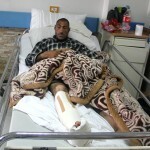 Arif was taken to the clinic and from there to the hospital again. An intestinal blockage, caused by the wound, was diagnosed. He was given medicinal treatment in the hope that surgery would not be necessary. The obstruction was reduced. He was x-rayed every two hours. The last x-ray, done at 3:30 pm showed an improvement. And then, at 7pm, Arif got out of bed, threw up and collapsed before his horrified family. He could not be revived and was pronounced dead. He was buried in his village the next day. It would seem that the IDF is lying. Because if Arif had tried to throw a Molotov cocktail at the soldiers, they would have arrested him immediately, as they usually do under these circumstances. The fact that the soldiers were in a hurry to get away shows that no Molotov cocktail was in the hands of the young man with Down syndrome. Arif’s siblings scoff at any attempt to foist accusations of any sort on him. They are convinced that, apart from shouting, he did nothing. They add that an Israeli security man, who did not identify himself, called later to threaten them not to make public accusations about their brother’s killing. We went to the site of the shooting. A pleasant twilight breeze wafted from the valley. No bloodstains remain on the rock; the neighbors cleaned them off. Here he stood and fell, and here stood the soldier who shot him coolly and brought about his death, before hightailing it.